Survivors, family members, and researchers have been working together for more than a decade to detect ovarian cancer earlier and educate women about its signs. EVERY SEPTEMBER, AVIS WAINWRIGHT leaves her farm and beehives in eastern North Carolina to travel to Raleigh for the Gail Parkins Memorial Ovarian Awareness Walk. 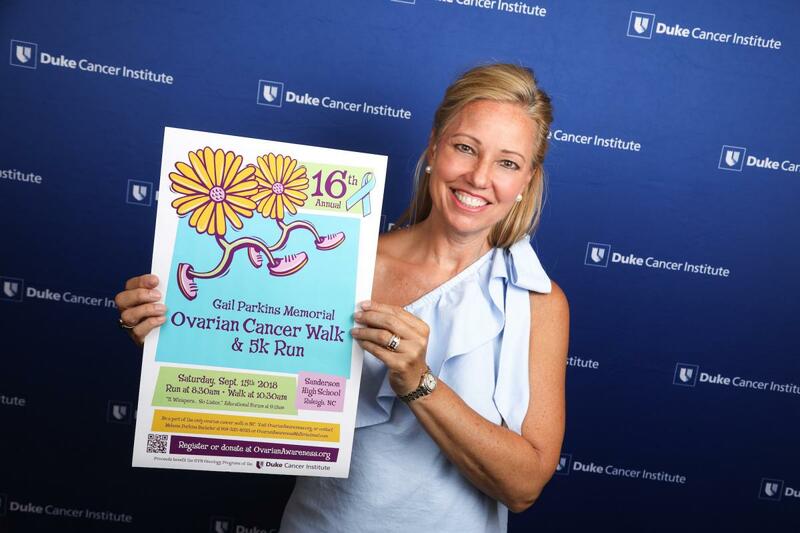 Raleigh resident Melanie Bacheler started the walk in 2002 to honor her mother, who had just died of ovarian cancer after two years fighting it with the help of doctors at Duke. The Parkins Walk, which raises funds for Duke gynecologic oncology research, was also a way for Bacheler to distract herself from her grief. “I wanted to do something for Duke for all they did for my mom,” she says. Wainwright faithfully attends the walk to honor her childhood friend Kathy. Much the same as Bacheler’s mother, Kathy went through months of primary care doctors treating her for irritable bowel syndrome and depression before being diagnosed with stage 4 ovarian cancer. The disease causes such vague symptoms—abdominal bloating, gas, discomfort, weight loss—that it often goes undetected until the later stages. 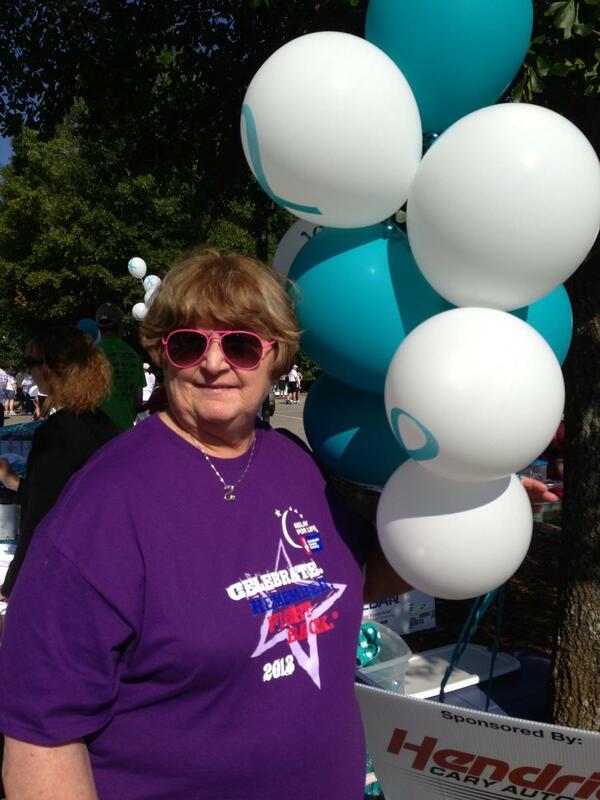 Wainwright attended the walk for the first time in 2011, when Kathy was first diagnosed. Kathy lost her fight with the disease in 2012. Wainwright has attended every year since. Except for 2016. Wainwright missed it because she was having chemotherapy. She had been diagnosed with ovarian cancer herself. When Wainwright began having stomach trouble in 2015, she didn’t think much of it. Her husband had just passed away, and she was taking over their farm and its corporation. “I started having abdominal symptoms but didn’t really pay attention because I just thought it was grief and stress,” she says. But as the symptoms continued, she thought of Kathy. And she remembered Bacheler’s mother, and all the information about ovarian cancer symptoms that Andrew Berchuck, MD, and other Duke doctors had presented at the educational forum at the walk each year. The disappointing fact is that, as with Wainwright and with Bacheler’s mother, ovarian cancer often sneaks up on women. For women with mutations in the so-called breast cancer genes, BRCA1 and BRCA2, it’s pretty clear that ovarian cancer risk is greatly increased. Steps to prevention include considering having their ovaries removed at age 40, after they are finished having children. But for most women, the path to prevention isn’t that certain. Berchuck and an international group of collaborators—the Ovarian Cancer Association Consortium (OCAC)—aim to change that. These researchers envision creating a screening tool that could predict individual risk. A woman would plug in her information—age, how many children she has had, smoking history, use of oral contraceptives, blood test results showing common genetic variants—and receive a personalized ovarian cancer risk score. “If we fully understood all the behavioral risk factors and common low-penetrance genetic variants that contribute to ovarian cancer, there might be another group of women who’d be considered at intermediate risk,” says Berchuck, who is a lead investigator for OCAC. Those women would be candidates for increased screening. Right now, the available screening test, which detects a blood protein called CA-125, which is elevated in some women with ovarian cancer, produces too many false positives to be used in all women. And those false positives cost too much, not only in health care dollars, but also in harm from emotional stress and needless surgery, according to work from Duke Professor of Obstetrics and Gynecology Laura Havrilesky, MD, MHSc. The OCAC has enrolled 100,000 women to date in studies that compare genetic and lifestyle differences in women with ovarian cancer and those without. That sounds like a lot of people. But Berchuck, the James M. Ingram Professor of Gynecologic Oncology, says it’s just the beginning. “We probably need 600,000 subjects if we really hope to define all the genetic variants that contribute to ovarian cancer risk,” he says. That’s because there are probably thousands of factors that increase risk by a tiny amount. When it comes to lifestyle, the factors that have emerged are related to reproduction. Limiting the number of times you ovulate in your lifetime, either by having children or by using oral contraceptives is linked to lower risk. But there may be many more factors that influence risk. In 2018, researchers from OCAC discovered 12 new genetic variants linked to ovarian cancer, and they published 28 scientific papers, some of them on lifestyle factors such as vitamin D levels and alcohol consumption. All of this seems daunting. And it will take time (the OCAC has been at it since 2005). But Berchuck and colleagues are committed. 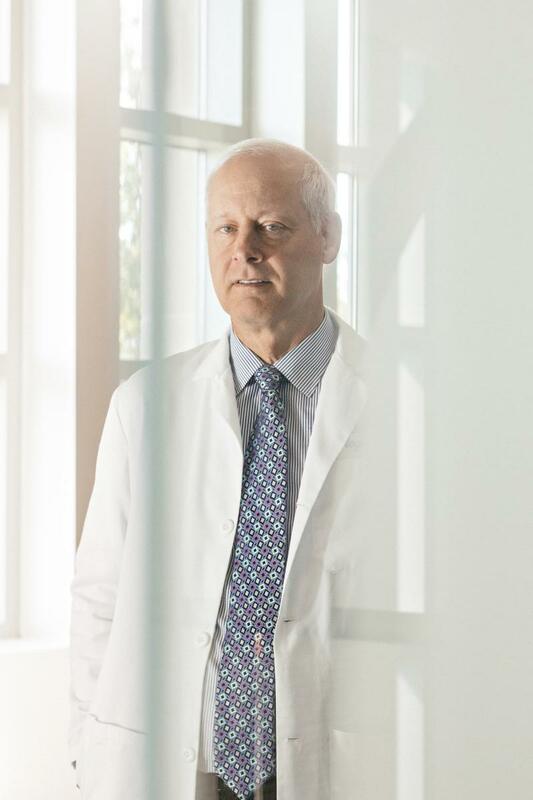 “I’m hopeful because we’re trying to make a better future, whether it’s through personalized risk prediction or through clinical trials of new therapies,” Berchuck says. That work and many other projects have benefited from the Parkins walk, which has raised more than $3 million since Bacheler started it in 2002. 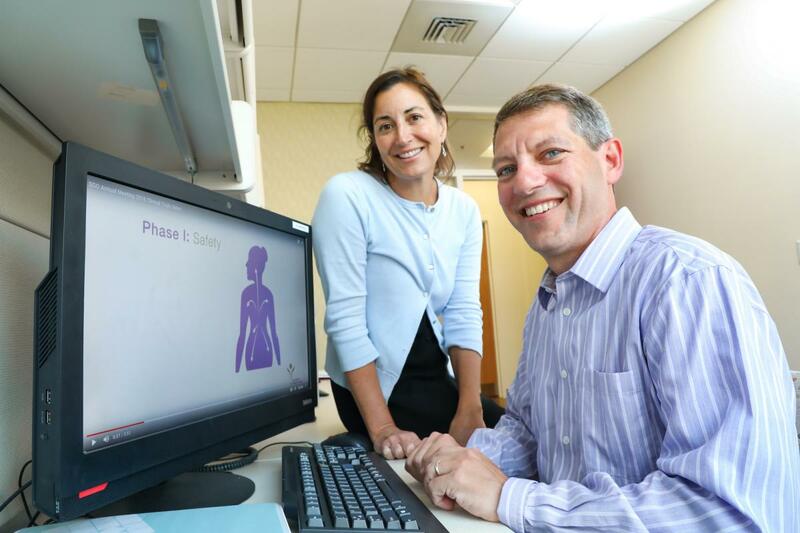 The funds have helped Duke hire new gynecologic oncology researchers and enabled them to move their research forward. But to many of the attendees, the walk’s most important accomplishment is spreading hope. As for Wainwright, after surgery, chemotherapy, and radiation at a hospital near her home, she has been cancer free for more than a year. She was back in attendance at the Parkins walk in 2017, though she was still exhausted from radiation.